Carmichael possesses superior lineage. His grandfather is Snowmass Cangalli Gold and his mother is AEA Delaney. His sire is Super Nova's Orion Nebula. At his very first show he captured a 2nd at the highly competitive 2009 North American Show in the juvenile white class. He placed 6th at the 2009 Northeast Alpaca Expo. You need not be reminded how competitive the white classes are! Judges comments were "brightness of fleece, good conformation structure, excellent density, presence in ring. 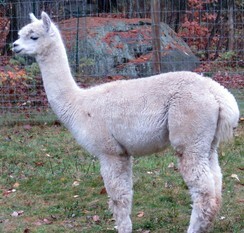 Di is a beautiful girl who gave a wonderful cria from our boy, Delaney's Carmichael. Di is a great mother,plenty of milk, and an easy birther. She is really laid back for a first time Mom. Carmichael's Destini has great conformation, with a soft handle, and crimpy bundles. Di also gave a beautiful white male, Eclipse. Destini is the dense beige girl you've been looking for! Her fleece is full of crimp and long, which was appreciated at the 2013 Northeast show where she won third.